They were the only people who came after hours and fixed the big mess that I had in my office. They came and took care of it, and I really appreciated that. I appreciated them doing their job and doing it well. They did everything that I needed them to do. The representative from Bellows was super friendly, very knowledgeable, and very competent. He was great. I liked how friendly and knowledgeable he was. He was very respectful of my space and he was clean with his shoes. He was very friendly and very competent. 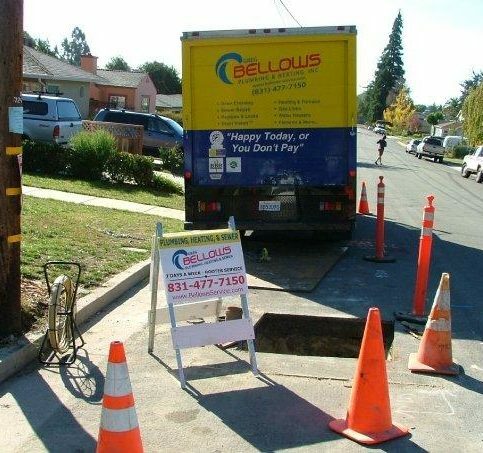 Bellows Plumbing, Heating & Air, Inc. provides a variety of plumbing; sewer; and heating, ventilating and air conditioning (HVAC) services for residential and commercial clients in Santa Cruz, Santa Clara, Marin, and Sonoma Counties. 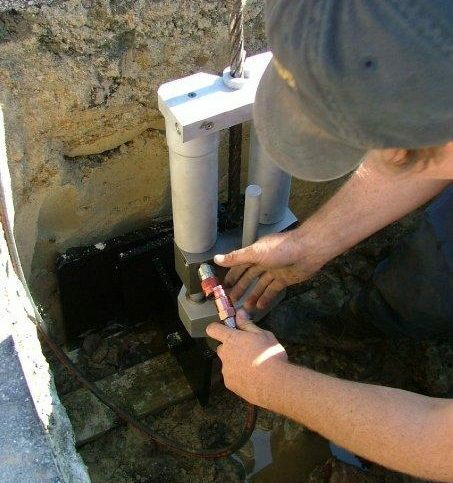 In addition to performing general maintenance on all types of plumbing and HVAC systems, the company detects and repairs water, sewer, and gas leaks; repairs vents, air ducts, and household fixtures such as wall heaters, water heaters, and disposals; and more. DIAMOND CERTIFIED RESEARCHED CAPABILITIES ON Bellows Plumbing, Heating & Air, Inc.
Company Name: Bellows Plumbing, Heating & Air, Inc.
DIAMOND CERTIFIED RESEARCHED ARTICLES ON Bellows Plumbing, Heating & Air, Inc.
"Our goal is to gain lifelong clients, so we work hard to always exceed their expectations by providing high-quality service, charging fair prices and following up after every service call. If our customers aren't 100 percent satisfied with our work, we'll make it right or refund their money." Sizing a tankless water heater is different than sizing a tank-type water heater. Sizing a traditional water heater means estimating the volume of hot water you’ll need within a one- to two-hour timeframe. Sizing a tankless water heater means estimating peak demand in terms of momentary usage—in other words, what’s the most you’ll be running at the same time? For a single person with low demand, this could be a single shower. For others, this could be multiple showers plus the dishwasher. Go online and find a hot water calculator to get a good idea of your flow rate. The primary measure you’ll hear people talking about with tankless water heaters is flow rate, which is measured in gallons per minute (GPM). In other words, how many GPM can be output while raising the water temperature by 35 degrees, 45 degrees, 60 degrees and so on? The larger the temperature rise, the less the unit can output. Look for a tankless water heater that’s marked with an “actual” flow rate. Electric tankless water heaters can be tricky to work with because they have lower outputs and require a lot of electricity. Each unit has its own electrical requirements, so you should consult an electrician prior to making a purchase. In terms of flow rate, most electric heaters can only run one major application (shower, dishwasher, washing machine) at a time. When sized with the proper gas lines, gas tankless water heaters can supply more hot water and are better choices for those with medium to high hot water demands. Gas heaters can be installed both indoors and outdoors, although indoors is best for cold climates. 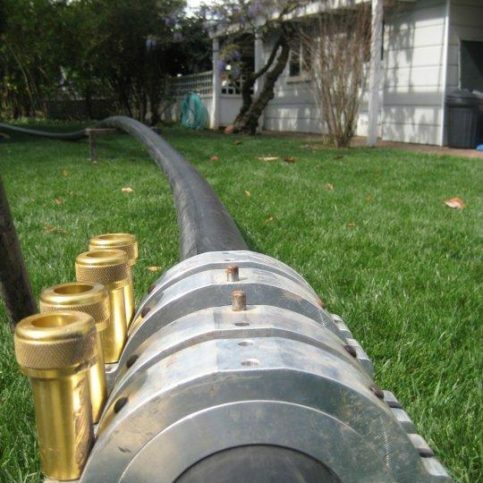 Outdoor installations can be less expensive since you eliminate the need for vent piping. If you find your peak demand is greater than any single unit can accommodate, consider a multi-unit (manifold) configuration. This type of setup is generally only required for commercial buildings such as condos, duplexes and restaurants, but it’s also occasionally used in residential buildings. However, if you think you might need a second unit, it’s likely your current unit is installed or sized improperly. Q: Can you provide an estimate over the phone? A: Yes and no. We don’t provide exact quotes over the phone, because most ‘standard’ problems aren’t really standard. It’s much better for us to determine the exact problem before giving you an estimate. If you’re within our service area, we don’t charge a service fee to come to your location. There’s no charge until you approve the price and give the go-ahead to do the work. However, sometimes clients simply want to get a price range over the phone, and we can usually walk them through the project and give a rough estimate. Q: How soon can you get the work done? A: In most cases, we provide same-day service. The most common cause of delay is ordering equipment, but we rarely have to do that. Q: Are your technicians broadly trained? 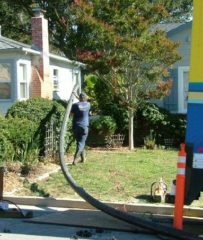 A: Yes, they’re cross-trained and can handle and diagnose most plumbing, heating, air conditioning, hydronic, solar, sewer and underground problems. We have a lot of specialists who know the ins-and-outs of all sorts of equipment. For example, we have one technician who’s building an airplane, another who was an explosives engineer, another who worked on oil fired boilers, another who helped build the Alaskan oil pipeline, another who builds computers, another who served in Iraq as a Captain…and the list of expertise goes on. A: Of course. We have a large number of local clients you can contact. 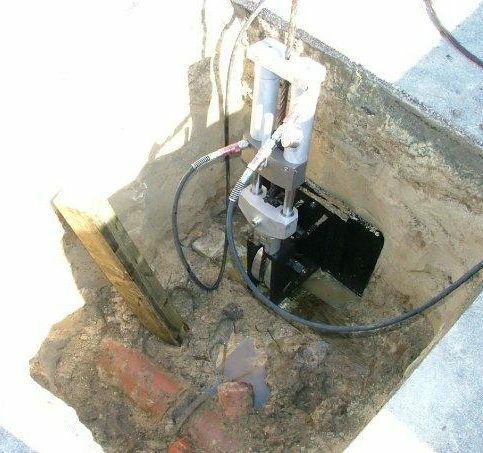 A: It’s a method for replacing underground pipes—sewer, water and gas—without digging a trench. 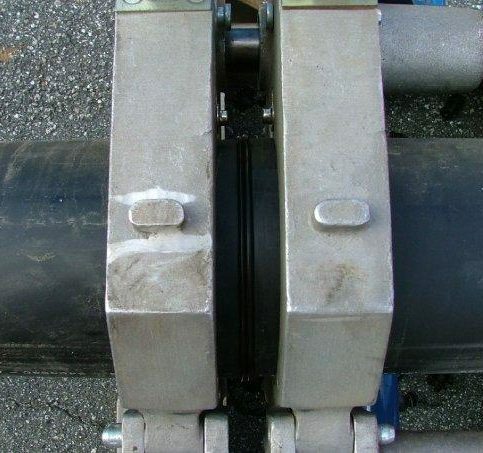 We can split the old pipe and pull a new pipe through the space left by the old one. 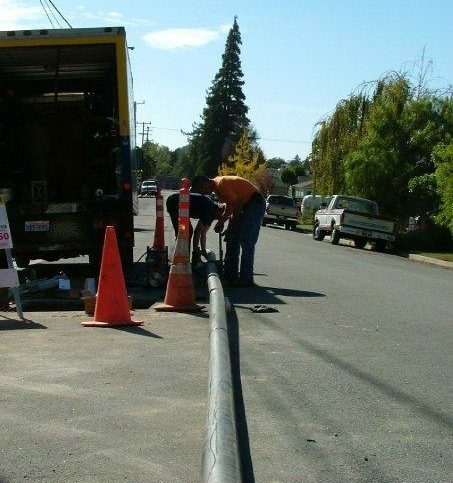 We can also install a new pipe without digging up the street, driveway or landscaping. 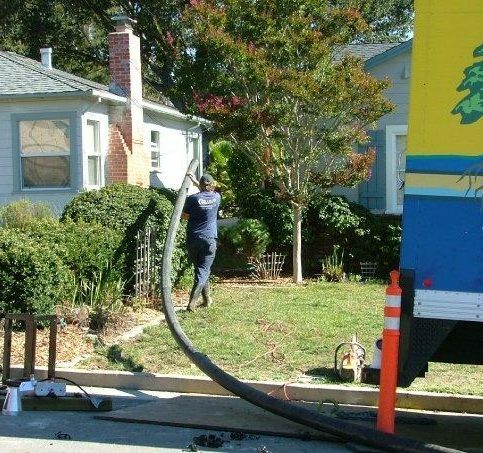 SELECTED PHOTOS FROM Bellows Plumbing, Heating & Air, Inc.
SANTA CRUZ — When it comes to assessing the condition of an HVAC system, age is a pertinent factor. I often meet clients who are proud to say they have a 50-year-old furnace that’s still working, despite not having been maintained. However, just because an older furnace is still operational doesn’t mean it’s safe. Any HVAC system should be regularly maintained, but it’s even more important for systems that are more than 20 years old. The biggest reason: older furnaces that haven’t been maintained are at a higher risk for electrical or combustion issues, both of which pose considerable safety hazards. Even when well-maintained, a furnace won’t last forever, so when yours reaches the 20-year mark, it’s a good idea to start budgeting for a new one. There are several advantages to replacing an older furnace, as today’s models offers superior performance, energy efficiency and safety. With a wide selection of HVAC systems to choose from, there’s something out there for every home size, comfort need and budget style. SANTA CRUZ – Host, Sarah Rutan: Even if your furnace is functional, that doesn’t necessarily mean it’s efficientor safe, for that matter. Today we’re in Santa Cruz with Diamond Certified Expert Contributor Jason Schlunt of Bellows Plumbing, Heating & Air to learn more. Diamond Certified Expert Contributor, Jason Schlunt: My piece of advice today is to look at your HVAC equipment. Age is a really critical piece of your HVAC system. I meet a lot of clients who – it’s kind of a plaque on the wall to say they have a 50-year-old furnace that’s still working, but hasn’t been maintained. The truth about HVAC is a system that’s not maintained should only last about 20-25 years at the max. If your system’s older than that and it’s still operational, it really needs annual maintenance. Just because it’s working doesn’t mean it’s safe to work. One of the problems with HVAC equipment is a furnace can keep running, but it can have electrical issues. It can have combustion safety issues, so it’s really important that every year you have your furnace inspected. One of the great things too about new furnaces is they’ve really come a long way from the old style units. They’re much quieter. They have all the modern safety features that make them much more efficient, much safer to work. So it’s something to consider. I tell clients when your furnace reaches about 20, 25 years, start budgeting for a new one, and what’s great about the new lineup of furnaces is that there’s a furnace out there that can meet every home, meet every comfort need, and meet every budget style. Host, Sarah Rutan:To learn more from local top-rated companies, visit our Diamond Certified Expert Reports at experts.diamondcertified.org. Diamond Certified RATINGS ON Bellows Plumbing, Heating & Air, Inc.
Bellows Plumbing, Heating & Air, Inc. : Average 8.8 out of 10 based on 335 unique customer surveys of customer satisfaction. I had an emergency and they came out right away and got it taken care of. I like that they got there immediately and they did really good work. I was very satisfied. If you have any plumbing needs, call Bellows. I've used them on my projects, as I am a general contractor. They can be trusted. They do not gouge up and they are the only plumber that I use. They told me exactly what they were going to do, and then did exactly that, very straightforward. They were quick and clean. They are very good at keeping in touch with their clients. I enjoyed their customer service. I would recommend that they should also use Bellows. The technician was very knowledgeable. They did a very thorough job. I would recommend them. They know what they are doing and they have a great price as well. Bellows is very timely and professional. The quality of work is excellent. They were so prompt, such a quickness in their response. They did a goof job. They were easy to work with. They really helped me with the whole process. I really enjoyed the efficient service. They are just on it. It was easy and quick to schedule the consultation and the work. They are a local company and they were able to schedule with. They were very professional and very helpful. Just the representative I spoke to was very nice. Very professional, reasonable, and they worked with Costco. They are punctual and reliable.